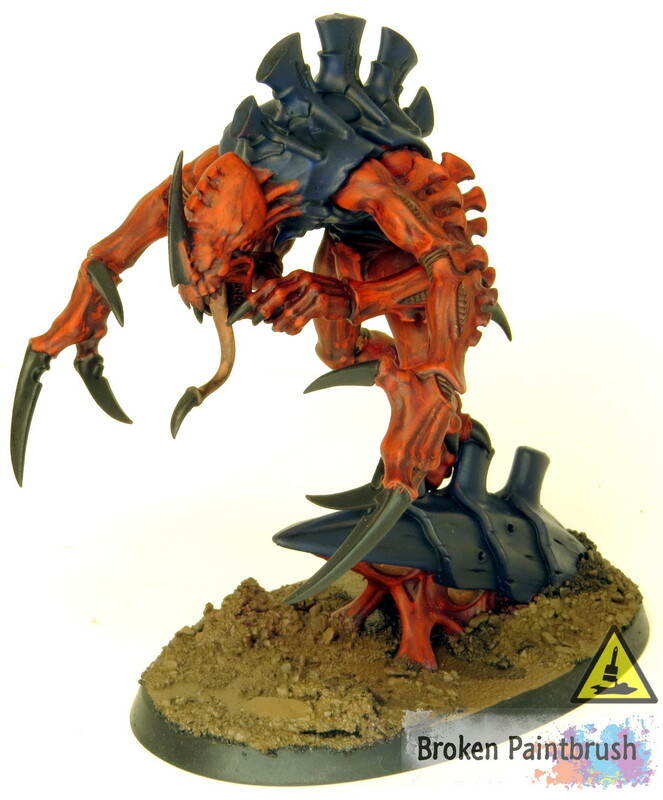 So after a good reception of my tutorial on painting a Hive Fleet Behemoth Carnifex, I’ve put together how I painted the Broodlord from the Shield of Baal box. My goal with these tutorials is two fold: first to document how I painted the model so I can repeat it for additional units in the army, and second, is to give back to the community. I’ve learned so much from my fellow bloggers that I want to contribute my little piece to the greater whole. 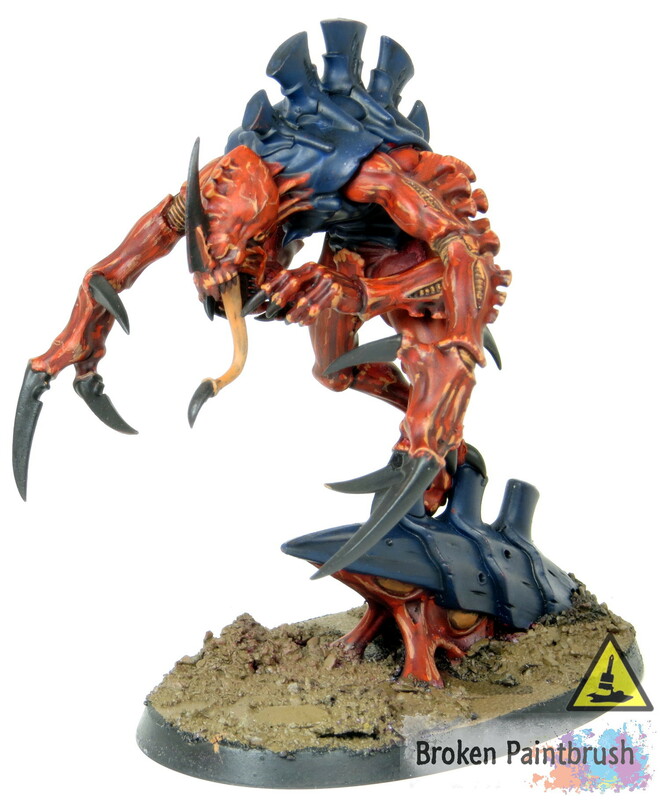 So if you are looking to paint up a Behemoth swarm, or just looking for ideas/inspiration for your own army, check out the steps below and see how straight forward it is to paint a decent looking army. The first step I have been doing with all my models is a two-stage primer. First I give it a nice coating of black followed by an top over-spray of white. The black undercoat provides a first level of shadows, any time I have tried to prime just white I end up with white primer still visible is some little cranny. The over-spray provides a lighter base color to start from while not going into the deep recesses. Kind of the best of both worlds. The next step is to use my spray gun to provide a nice base coat of Mephiston Red. I have done very little with air brushing, and have only the cheapest kinds that still blow paint, but they are enough to base coat which saves a huge amount of time when I do a couple of models at once. This step does take a few layers to get a nice even coverage of red, but not too much that you loose any benefit of the two-stage primer. You want the red on top to be bright from the white undercoat and the red underneath to still be a bit dark from the black. I am a big fan of blocking in all the base colors before getting to far with any detail work. For me this helps provide an overall look between the different colors and gives a sense of where all the details are. So many times before I would be going along only to realize that I missed an entire section of skin or armor. 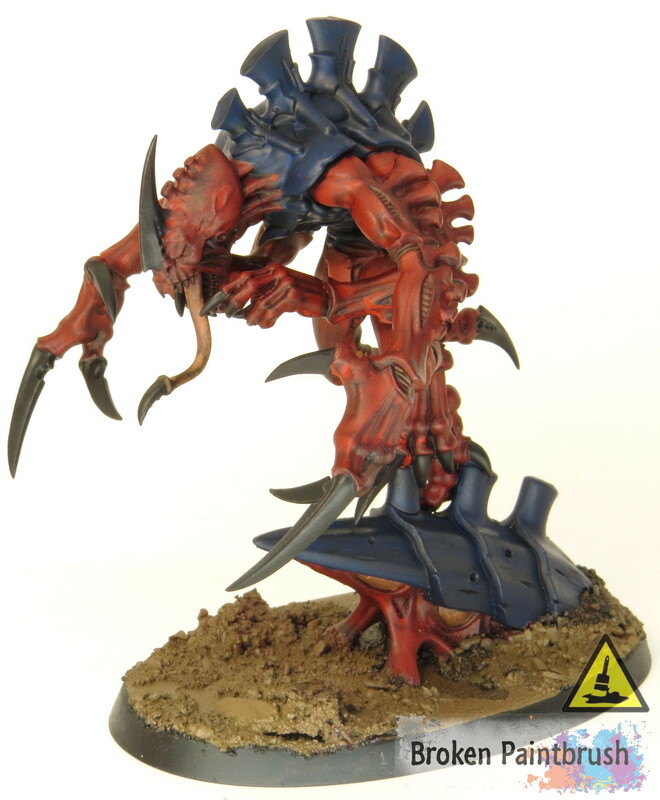 So for the Broodlord I based in the blue with Necron Abyss, the black with Abaddon, and the fleshy bits with Ratskin Flesh. Any mistakes were easy to recover at this point since there is no highlighting to work back in. Another reason I love blocking in the colors: applying a full body wash, in this case Vallejo Dark Brown Wash which you can pick up for $8 bucks on Amazon – trust me you won’t regret switching, a much better deal than Devlan Earth. Not only does the wash create the shadows we need, but it also provides a nice dark line between the colors, especially the light flesh. 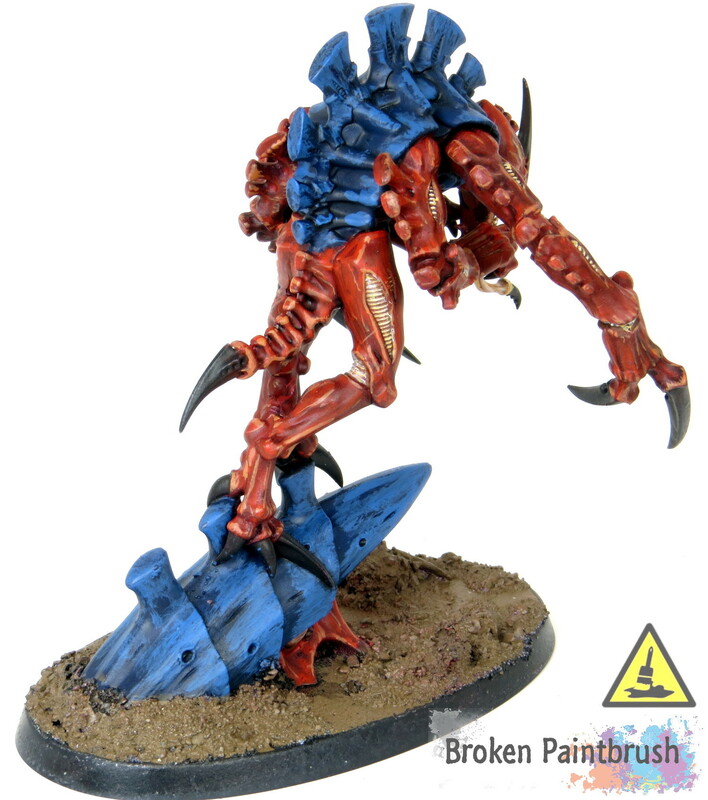 The blue carapace also received an additional wash of black to make it extra dark. So now we are starting the red highlights. For this I am using Evil Sunz Scarlet and basically painting everything that is not a recess. On the flat head I add some texture to create some interest but overall it is fairly straight forward highlight. 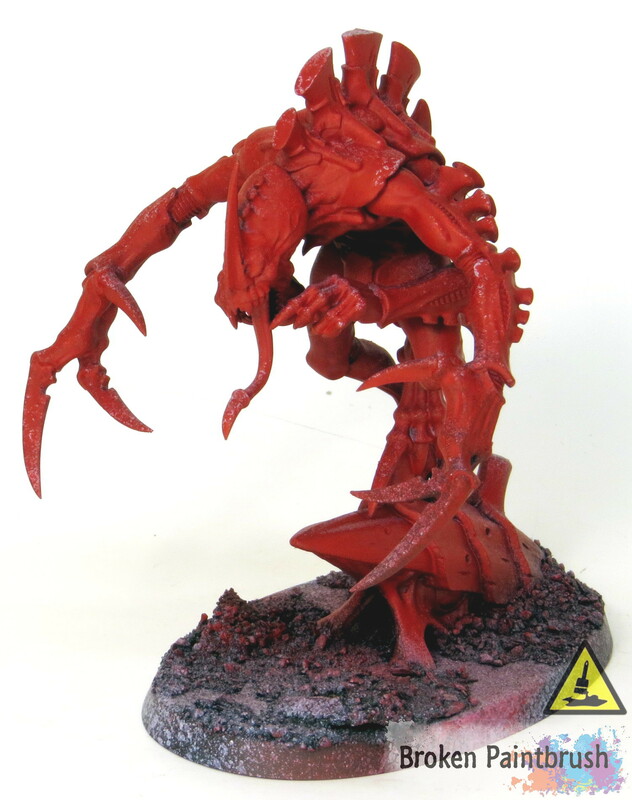 Next I break back out the Ratskin Flesh for both the extreme highlight of the red and to re-layer the flesh areas. I like using the same color for both to help tie them both together a bit, they are both part of the ‘skin’ area after all. For the red areas this was used on the hard edges, upper areas of the smooth muscles, and the veins popping on the head. 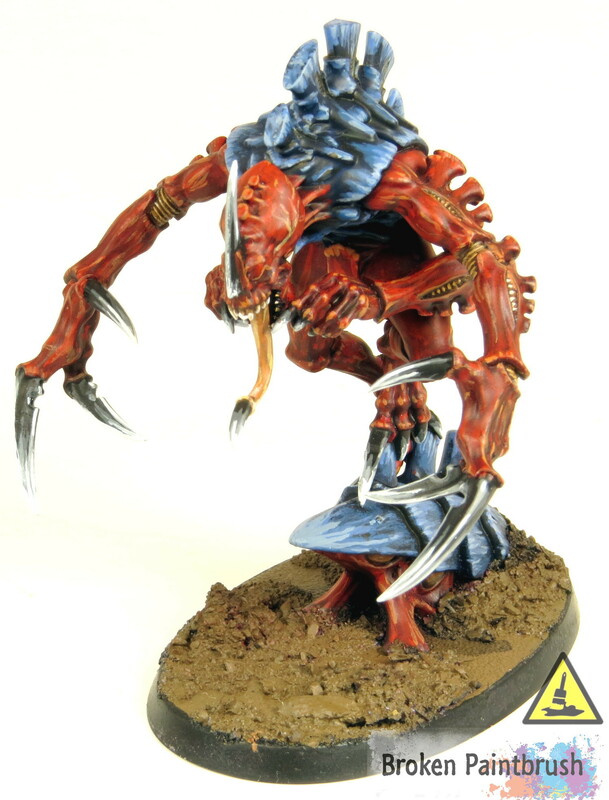 Next up the fleshy bits were highlighted with Ungor Flesh. This was also used on the teeth to provide their base coat. 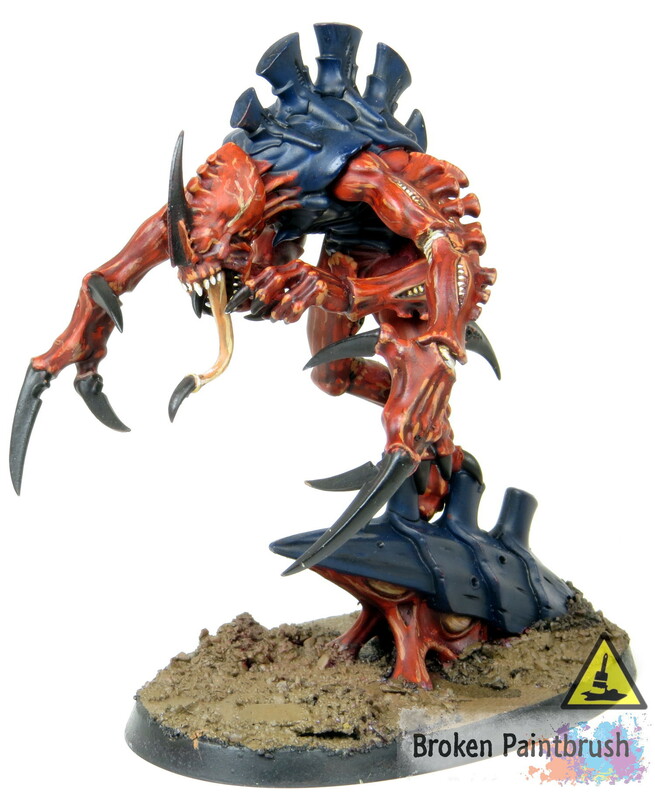 I tried to keep it to the upper ridges of the vents but some of those are too small to keep clean, but no worries, I take care of that in a later wash.
Pallid Wych Flesh was used for the extreme highlight of the fleshy areas and the teeth. The Brown Wash was again used to carefully add definition to the teeth and vent recesses. This wasn’t a ‘dunk it’ sort of wash but rather I used the fine detail brush to make sure it was applied only to the recesses. Now the fun begins. 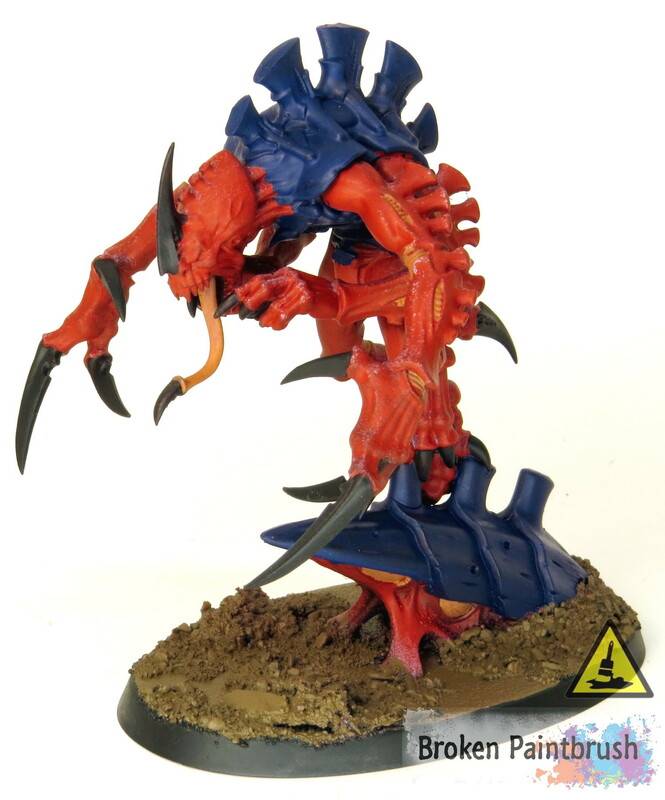 As Greggles pointed out in my Carnifex tutorial, the blue is what helps make the Behemoth models start to pop, even with just the first highlight. 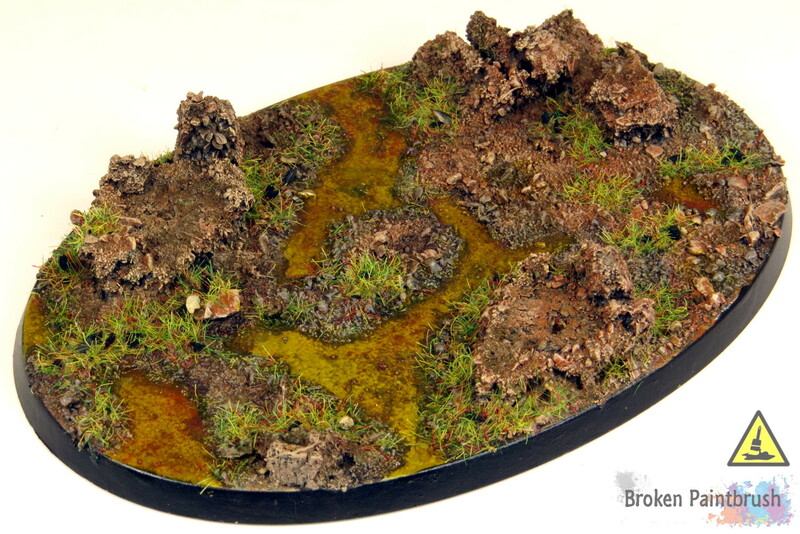 For this we start with Caledor Sky and keep it to the edges of the armor plates. 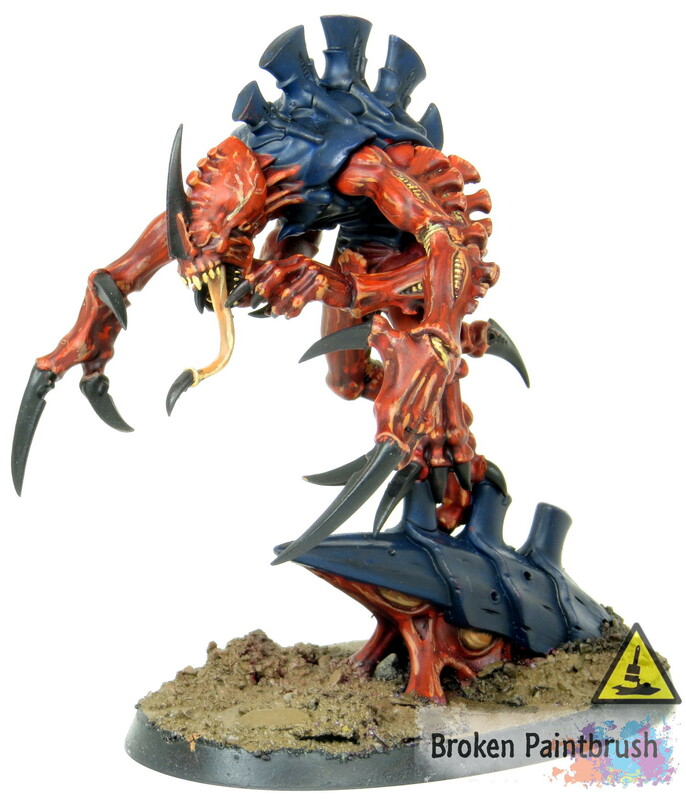 The genestealer armor is a bit different than the other tyranid models in that it doesn’t have the same overlapping plates, but the idea is the same: create long, thin strokes that taper toward the armor edge. This is also the same for the flutes along the back. 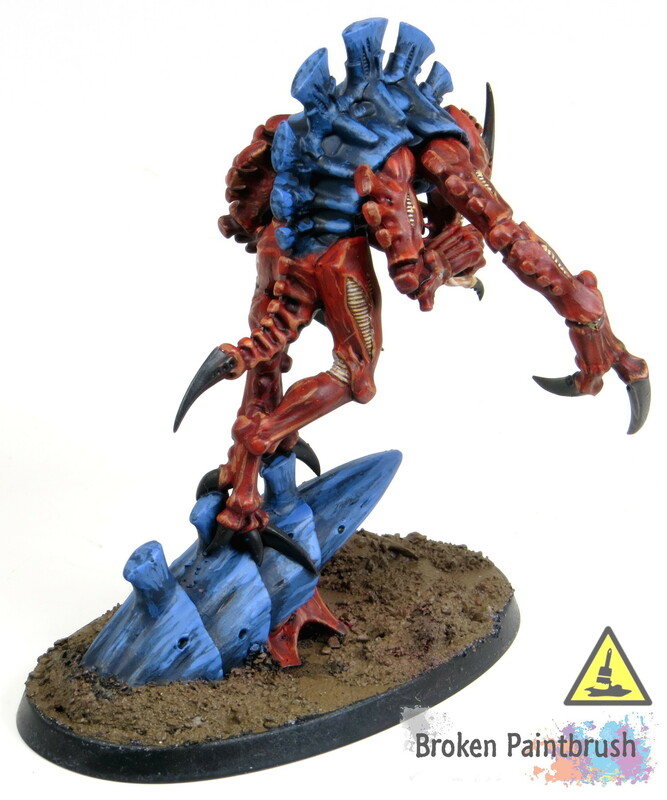 The mid-tones for the carapace was Calgar Blue. This was kept closer to the edges and in streaking patterns. 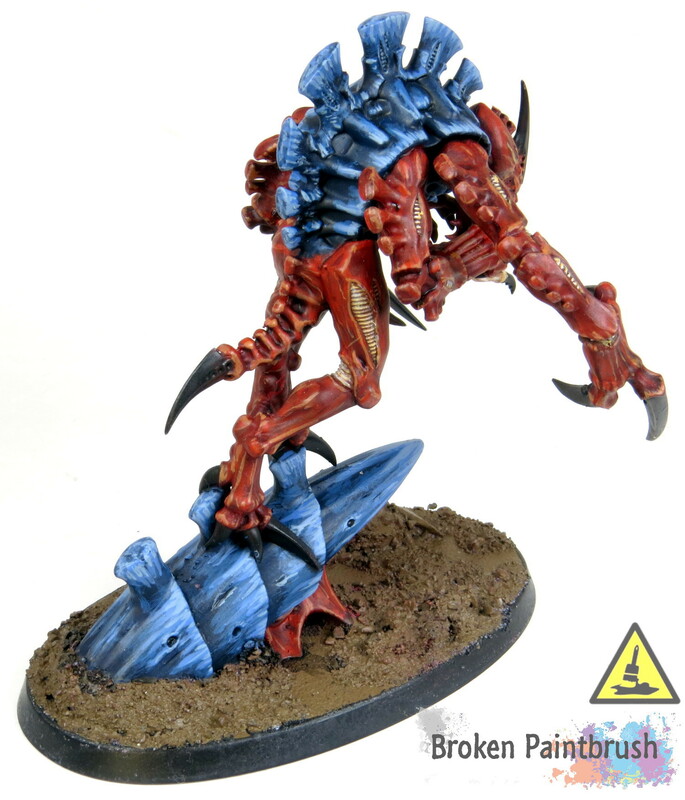 The extreme blue highlighting was done with Fernisian Grey and kept very close to the edges. This is an almost white blue and provides a nice strong contrast to the deep blue in the recesses. The black claws, talons, and horn were all edge highlighted with Mechanicus Standard Grey. This layer was kept fairly broad to accentuate the true black in the recess. The black areas were then given additional layers of Administratum Grey followed by Ceramite White. The white was kept near the extreme edges to provide a nice, sharp look. The eyes were then painted using Yriel Yellow for the base coat followed by a layer of Flash Gitz Yellow. The brown wash was again used to back-line against the red and provide the pupil. I’ve been using the washes to create the pupils lately because it provides a softer look. Black can come across as cartoony because of the intensity, but a layer or two of dark brown wash works really well. 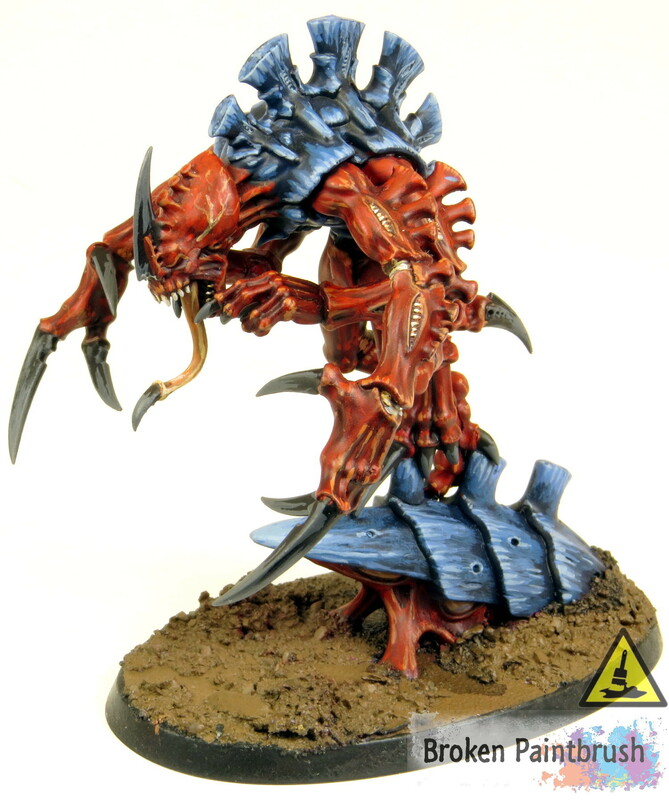 I didn’t take any pictures of painting the Broodlord’s base, but you can check out my tutorial on painting the Carnifex’s base to get an idea on how it goes. This is clearly a personal thing as everybody has their own base style, but I like to save painting it to the end, in part because it signals me that I am almost done. And we are done! Well almost, after finishing the base I go back over the model and do any touch-ups from stray paintbrushes. I then do a layer or two of matte varnish to seal it up and protect the paint. ‘Ard Coat was then used on the water effects and tongue to give them a sheen. See, that wasn’t too bad. I think that some times we see the end product and think we could never get there, without realizing that it is just a series of steps between here and there. 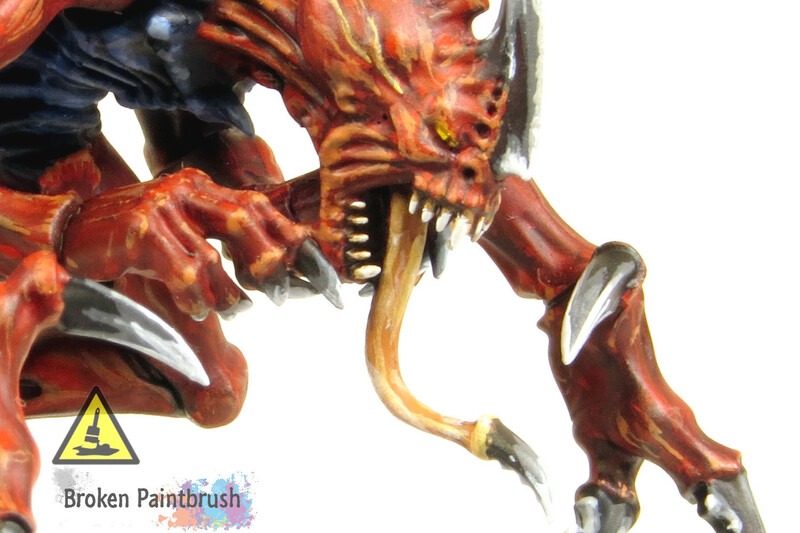 I know I have a long way to go to get to the level of the painters I look up to, but as I follow their progress updates and tutorials I learn bit-by-bit. If you found this tutorial helpful, do me a favor and hit up the share buttons and leave a comment below.